The tweets came fast and furious, marveling at what some may see as a metaphor for Trump’s tenure: The president, arms spread, in the formal State Dining Room of the White House, with a feast of boxed fast food stacked neatly on silver trays between gold candelabra. George P.A. Healy’s 1869 oil painting “Abraham Lincoln” painting looks on from above. It’s quite an interplay: opulence and modesty, high and low, point and counterpoint, Trump in the middle. It evoked a period costume romp about royals or some dark comedy on cable. For some, it was hard to look away. It’s a gesture, Baker said, that calls to mind executions and political protest paintings. “The Third of May 1808” by Francisco Goya and “The Execution of Emperor Maximilian” by Edouard Manet feature similar positions. The subject matter is also evocative. Baker pointed to “The Land of Cockaigne” by Pieter Bruegel the Elder. It depicts a feast taking place in “a medieval land of plenty, which is appropriate as an allegory” for the White House event, Baker said. In it, the food prepares itself: A goose lays down on a plate, an egg walks on two legs with a knife in its cracked shell, a pig carves a strip of bacon from its side. For Baker, though, the most interesting thing about the photography is the interplay between Trump and Lincoln. Healy’s “Abraham Lincoln” was completed before Rodin’s “The Thinker” sculpture, though the pose is the same and has been used throughout art history to depict contemplation, including in Michelangelo’s tomb for the Medici princes. On Twitter, people got tired of the photo quickly. 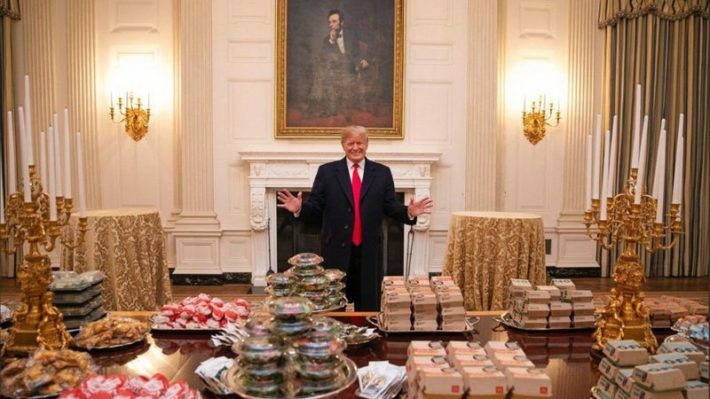 “How do I mute a photo” could well be 2019’s “Twitter needs an edit button.” But the photo’s resonance shows that even in an age where Big Macs substitute for a state dinner, people can still find parallels to fine art where they least expect it.